315 Gallery is pleased to present Running Towards the Sun, a group exhibition featuring the work of Guadalupe Maravilla, Grace Rosario Perkins, and Efraín Rozas. The three artists create paintings, sculptures and instruments that draw on both indigenous traditions and invented personal practices, in order to fortify and reorient the self amidst conditions of displacement and global capitalism. Hailing from El Salvador, New Mexico, and Peru, respectively, Maravilla, Perkins, and Rozas embrace ritual as a contemporary technology—one that can be made, and remade by individuals in response to immediate concerns. The exhibition’s title, which takes its name from a painting by Perkins, speaks to the generative, energetic life of their practices and their immeasurable, if capacious effects. Guadalupe Maravilla also contributes an altar to the space with Shrine for the Undocumented Children, a new installation made in response to the ongoing U.S. immigration crisis. Maravilla, who immigrated to the States alone as a child from El Salvador to escape civil war, has devoted his artistic practice to raising awareness around the struggles of undocumented immigrants and asylum seekers. His interdisciplinary and collaborative work is driven by a belief in art’s capacity to shape spaces of healing, and often involves choreographing collective rituals that draw on his own Mayan/Mestizo ancestry. Maravilla transforms his personal shrine into a larger piece that pays tribute to children who were lost while journeying to this country. It includes totemic objects and materials including casts of children’s boots, jugs of water, and soil from the U.S./Mexico border, and the artist’s native El Salvador. The piece extends onto the wall with a drawing that reinterprets a Salvadorian children’s game called Tripa Chuca, in which players take turns drawing lines that do not intersect. Dating to Pre-Columbian time, the game is a kind of ritual that for Maravilla can be used to form a map between persons who share experiences of border-crossing. During his journey to the U.S. as a child, the the artist often played the game alone with himself, an experience which he revisits here. Painting as a space of forward-motion and renewal concerns Grace Rosario Perkins who contributes Running Towards the Sun, for which the exhibition is named. The painting refers to a Navajo puberty ritual called kinaalda, in which a woman gets up at sunrise and runs towards the sun to mark her first menstrual cycle. Perkins, who grew up living between between city centers in New Mexico and California as well as the Navajo Nation, and the Gila River Indian Community, missed the act as a teen, reclaiming it later in her thirties as a kind of extended puberty ritual. The painting revisits it again, embedding the phrase into an expansive, dense field of warm color that spreads musically across the canvas. Perkins, who considers herself a maximalist, sees color as a sacred and symbolic universe that has been historically erased by colonial powers. The piece looks energetically to history as a means of future investment, and self-care. Guadalupe Maravilla (b. 1976, San Salvador, El Salvador), formally Irvin Morazan, adopted his undocumented father’s fake last name Maravilla to show solidarity with undocumented immigrants during these challenging political times. As a child Maravilla immigrated alone to the United States from El Salvador, escaping civil war, and remained undocumented until he was 16 years old when he became a US citizen. Maravilla, whose work draws on this personal experience, has performed and presented his work in venues such as the Whitney Museum, New Museum, Metropolitan Museum of Art, Bronx Museum, El Museo Del Barrio, MARTE (El Salvador), Central America Biennial X (Costa Rica), XI Nicaragua Biennial (Nicaragua), Performa 11 & 13, Vooruit (Belgium), Fux-Box Festival, and Exit Art. He has been an artist in residence at LMCC Workspace, SOMA, Skowhegan School of Painting & Sculpture, and Drawing Center: Open Sessions. Awards and fellowships include the Creative Capital Grant, Joan Mitchell Foundation Emerging Artist Grant, Art Matters Grant, Art Matters Fellowship, VMFA Fellowship, Dedalus Foundation Fellowship, and The Robert Mapplethorpe Award for Photography. Grace Rosario Perkins (b. 1986, Santa Fe, NM), is an Albuquerque and Oakland-based artist who has spent most of her life living between city centers, as well the Navajo Nation, and the Gila River Indian Community. Her work examines cultural dissonance, disassembling and rebuilding personal history through explorations with color, abstraction, and language. 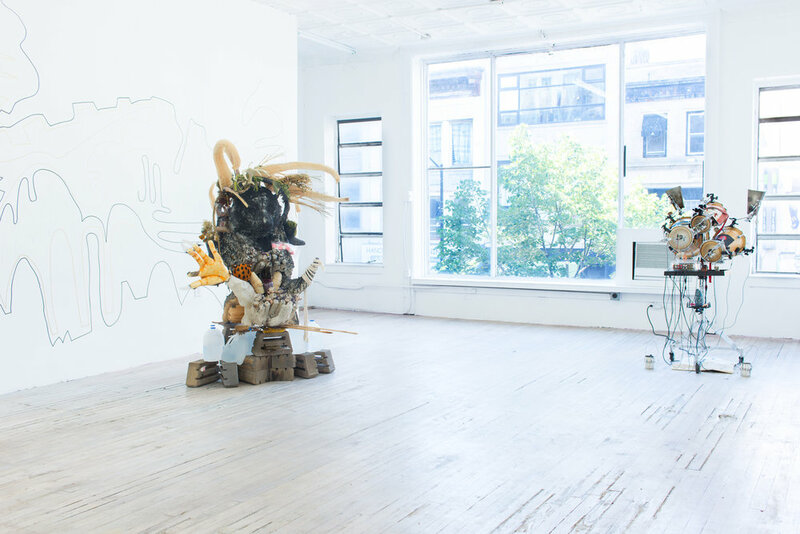 Perkins’ practice, which includes painting, printmaking, sculpture, and performance, is highly collaborative and often made with family members such as her father Olen Perkins, and artists from her indigenous and DIY communities. She was a founding member of Black Salt Collective, a group of queer women artists of color that worked to amplify black and indigenous voices. Perkins has lectured at venues such as Mills College, Pomona College, UC Santa Barbara, Occidental College, the San Francisco Public Library, Real Time and Space Oakland, and the Museum of Arts and Design, New York. She has been an artist in residence at Facebook HQ, ACRE, Varda Artists Residency, Sedona Summer Colony, White Leaves, Kala Art Institute, and was nominated for the Liquitex Painter's Residency and Tosa Studio Award at Minnesota Street Project. Efraín Rozas (b. 1979; Lima, Peru), is a Brooklyn-based performer, composer and robotics/software developer, whose practice merges experimental technologies with Latin American genres, to expand the possibilities of sound. His research focuses on experimentalisms of the Global South. Rozas holds a PhD in composition and ethnomusicology from New York University and is the author and producer of Fusión: A Soundtrack for Peru (2007). In 2011 Rozas founded La Mecánica Popular, an experimental salsa band that performs regularly in New York. For over ten years he has been the host and producer of the acclaimed radio show “La Vuelta Al Día En 80 Mundos,” which offers a poly-centric listening experience, by connecting traditions and experimentalisms from across the world. Rozas has released several LPs though Names You Can Trust, the Ethnomusicology Institute of Peru, and the Embassy of Spain, and has performed at Lincoln Center, Brooklyn Museum, Queens Museum, Levitation Festival, and Crazy Music Festival in Luxembourg. He has attended residencies at Art Omi and Marble House, and in 2018 received commissions through Knockdown Center and Harvestworks, and a grant from NYSCA/Wave Farm Media Arts Assistance Fund. His work has been featured on CNN, BBC, Washington Post, Daily News, Wire Magazine, and NPR Soundcheck. He currently teaches at NYU.